Hey Friends! 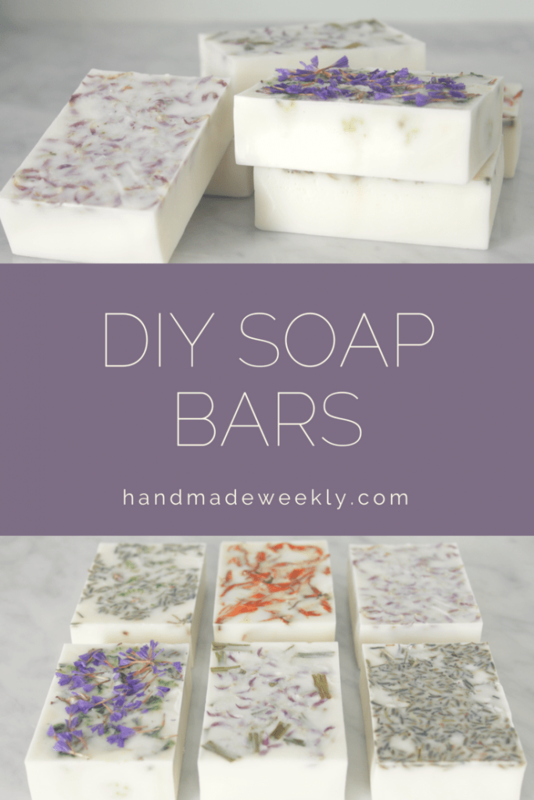 For this week’s post I am sharing how I made DIY soap bars in less than 5 minutes. This was my first time making soap and I’m officially hooked. It was so much easier than I had ever expected and I had a ton of fun making them too. Truth be told, this post wasn’t my idea. While I love pretty soap, I never really thought to make them on my own. My husband actually requested that I do this so I figured I’d give it a try. 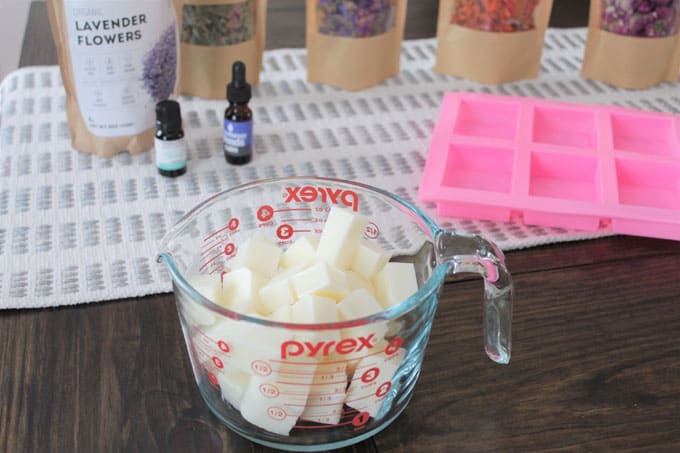 With just a few supplies, you can also be on your way to making custom soap bars. It should be noted that I used goats milk soap base for my recipe. This stuff is great. 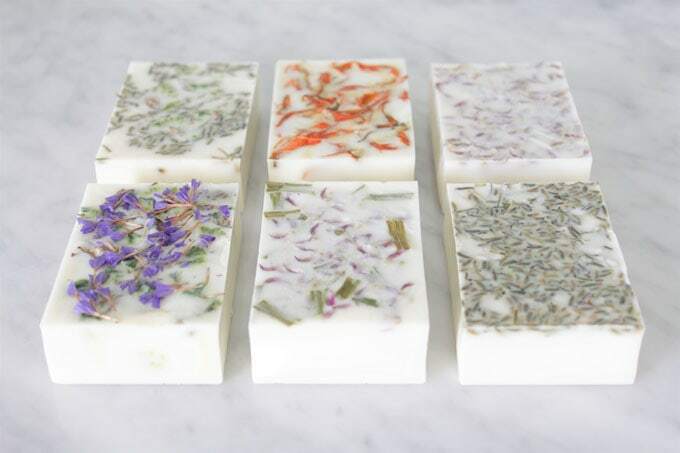 All of the hard work is already done for you so you can just focus on how you want the soaps to look and smell rather than getting all of the proportions right so that it actually turns out. 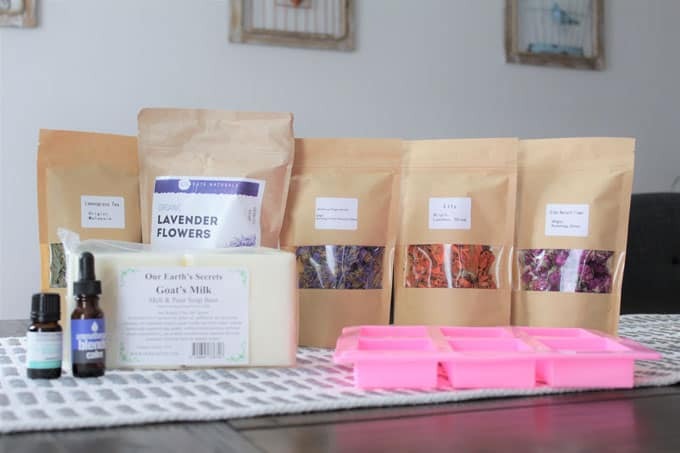 You’ll need a few supplies to make floral soaps like mine and all of the supplies can be purchased from Amazon. Here is what you’ll need to make 6 bars of soap. 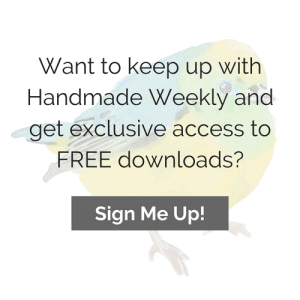 Some of the links below are affiliate links, meaning, at no additional cost to you, I will make a commission if you click through and make a purchase. 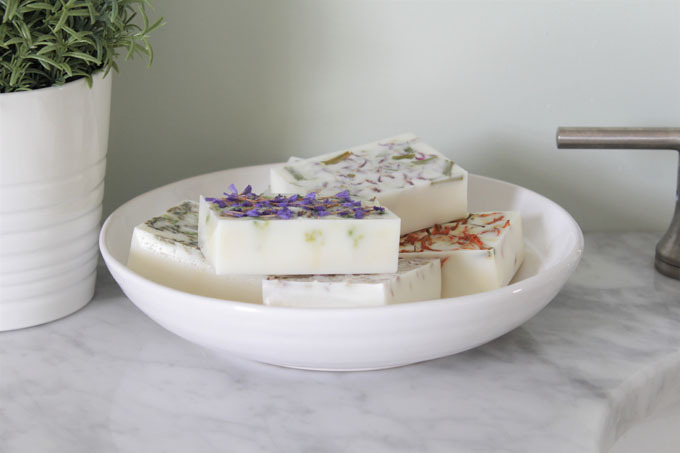 Cut the goats milk soap base into small chunks and then place them into a microwave safe dish (preferably one with a spout designed to pour from). I used my large pyrex measuring bowl and it worked perfectly. I started with just half of the goats milk soap base because I wasn’t sure how many bars I would get out of it (spoiler alert, it’s 3). Also, I knew I wanted two different scents so I needed to split the batches. Microwave the goats milk soap base in 30 second increments stirring every 30 seconds until it is full melted. For me this took about 90 seconds but all microwaves vary so just keep an eye on it. 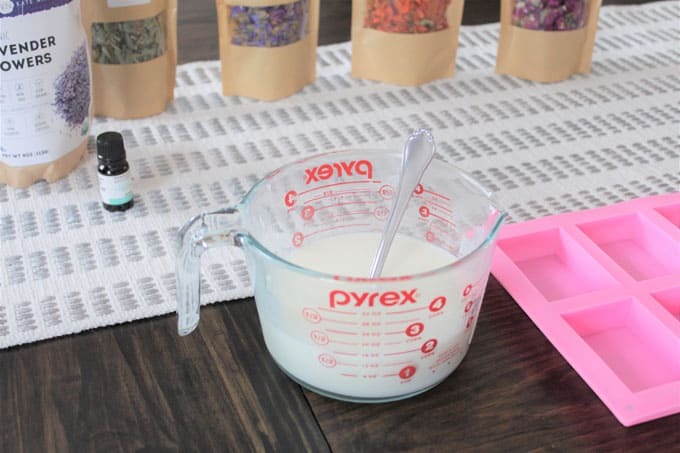 Add essential oils to the melted goats milk soap base and stir it all together. You can get creative here and mix scents or go an easy route like me and stick to one. so that I could make a variety of soaps. Top with additional flowers if desired. Then let the bars sit for at least 2 hours before removing them from the mold. If you use a silicone mold like the one that I’ve linked to they should come out very easily. 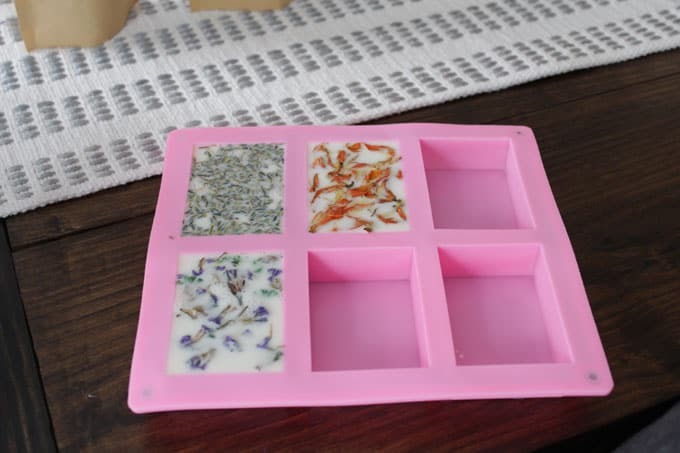 If you’re using a mold that isn’t flexible, you may want to grease it before you pour in the soap base. That’s all it takes guys. In about 5 minutes you can have six pretty bars of soap that smell amazing and suds up very nicely. Just look at how pretty this soap is. I wish I would’ve figured out that soap could be this easy to make a long time ago. If you like this soap tutorial, check out my tutorial on DIY Bath Bombs. I can only imagine how good these soaps smell! What an awesome DIY! They smell better than they look! What a great result for your first time making them Hannah. 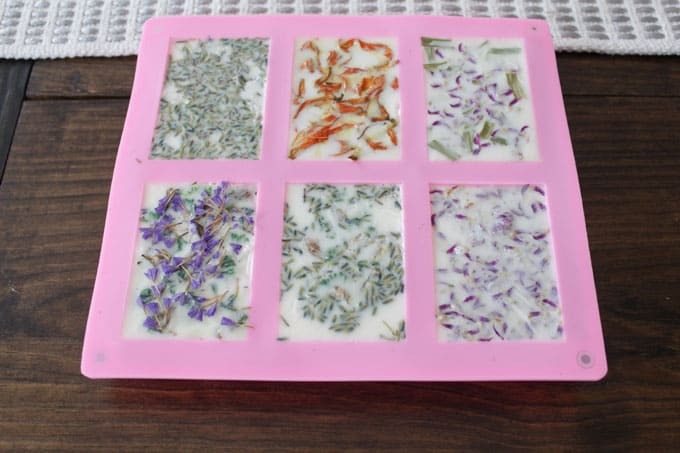 Thank you for sharing your homemade soaps tutorial at Create, Bake, Grow & Gather this week. I’m delighted to be featuring them at tonight’s party and pinning too. Thanks! I’m sure yours will come out just as pretty. It was way easier than I had expected. Hi Mel. I’ve definitely had some issues in the past with lavender bleeding through the soap over time. It creates a lovely brown soap when that happens 😉 It seems like some batches are higher quality than others because I haven’t had this happen every time that I use lavender. To completely eliminate the issue, I tend to use the lemongrass, lily and globe amarath as I haven’t had any issues with those bleeding color. The limonium sinuata will bleed a little bit over time but not very much. I haven’t tried rose pedals so I can’t speak to that. My recommendation is to find flowers that work for you and stick with them. Hope this helps. This is exactly the kind of soap I’d like to make, thanks so much for sharing on craft schooling sunday! Of course! I’m so glad that you found the tutorial helpful.